This assortment features approximately 4 ounces of hand-dyed buttons and may include both sew through and shank type buttons. 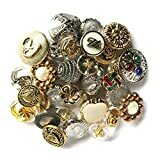 Size Range is 1/2" to 1"
Interested in the Buttons Galore HAB109 Haberdashery Button, Gold/Silver, Pack of 100? Is the price too high? You can easily price watch this product and we'll notify you when the price reaches your target.